After having my wedding dresses showcased in the fashion show at the 2011 Mid Atlantic Green Wedding Showcase last weekend, I learned more about creating a truly eco-friendly wedding. I wanted to share some tips with you. The most important thing i learned is that going “Green” can save the earth as well as your pocketbook. Invitations ~ Of The Earth (www.earthinvitations.com) or Earthly Affair (www.earthlyaffair.com). 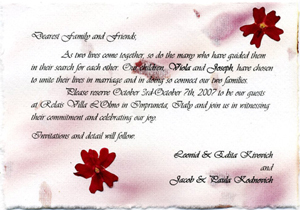 Some eco-friendly paper companies offer a one-piece option for the invitation. This style has a tear-off RSVP card, reducing the amount of paper needed. Décor ~ Nature is full of beautiful items that can be utilized to decorate then be returned to nature after the wedding; rocks, twigs, flowers, potted plants, trees, leaves. Use bamboo – one of the most sustainable materials on earth, bamboo is an eco-friendly décor option with an organic, modern feel. Disposables ~ Forget about disposable plates, napkins, silverware and all that. Opt for rented china, crystal, and flatware that can be washed and reused. For a small affair, consider purchasing tablecloths, plates and tableware that you could reuse in your home after the wedding. Favors ~ Edible favors like chocolates or homemade jam are a sweet reminder of your special day. 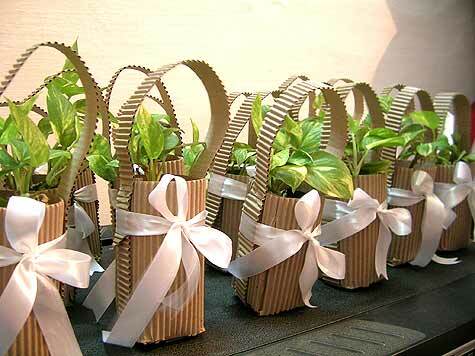 Another wonderful favor alternative is a donation your favorite green charity, made in honor of your wedding guests. Location ~ Have ceremony and reception in the same location. Find a green (LEED) venue. Flowers ~ Use your ceremony arrangements to the reception! Find a local florist who can provide organic blooms. Skip cut flowers altogether. Opted to use potted arrangements. Your guests can take them and plant in their yards after the wedding. Vendors ~ Choosing the right vendors is a key component of a green wedding. A resource like The Green Bride Guide (www.greenbrideguide.com) can help connect you to trustworthy green vendors. This entry was posted in Green Weddings, Wedding Advice & Tips, Wedding Decor, Wedding Details, Wedding Favors & Gifts, Wedding Flowers, Wedding Invitations & Stationary, Wedding Planning and tagged Eco-Weddings, Green Weddings, Wedding Day, wedding de, Wedding Details, Wedding Favors, Wedding Favors & Gifts, Wedding Invitations, Wedding Invitations & Stationary, Wedding Locations & Venues, Wedding Planning, Weddings. Bookmark the permalink.